Taking place at Ascot racecourse in July of each year, the King George VI and Queen Elizabeth Stakes, sometimes referred to as the King George, is a group one event open to horses aged three years old and more and is run over a distance of 1 mile 3 furlongs and 211 yards . The race first took place in 1951. The name of the event comes from the fact that is was conceived via the coming together of two separate races in the 1940s (the King George VI and the Queen Elizabeth). The intention was to create a race that would have massive national and international appeal; it’s certainly succeeded in that aim. The event is a flat race of quite some acclaim and has hosted some of the most memorable match ups in our time. Many an article has been written for instance about the rivalry between Grundy and Bustino, in the 1975 King George VI and Queen Elizabeth Stakes. 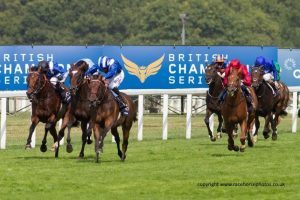 Bustino and Joe Mercer had been four lengths clear on the final straight, but Grundy grinding out and edging the win after the two gave everything they had was a sight to behold. Although the race isn’t part of Royal Ascot it is viewed by many to be the courses most prestigious race. As part of the Breeder’s Cup Challenge, the winner of the The King George VI and Queen Elizabeth Stakes gains automatic entry into the 1 1/2 miles Breeder’s Cup Turf race held in the United States or Canada as part of the Breeder’s Cup World Championships. Sponsored in recent years by Betfair, the betting exchange company topped up an already impressive purse to the £1,250,000 mark, with over £700,000 going to the winner. It’s second only to the Epsom Derby which has a £1.5m prize pot. As you’d imagine, a race this desirable attracts the very best, and that is certainly the story told by those achieving success here over the years. The leading jockey in the King George is Lester Piggott with seven wins, one of which was the famous Nijinsky. Leading trainer is Michael Stoute with six wins, the first of which was Shergar in 1981, and leading owner is Michael Tabor with six wins also. It’s a who’s who of racing’s high achievers.